Mazel Tov! There have been a lot of little milestones in your life leading up to this one. 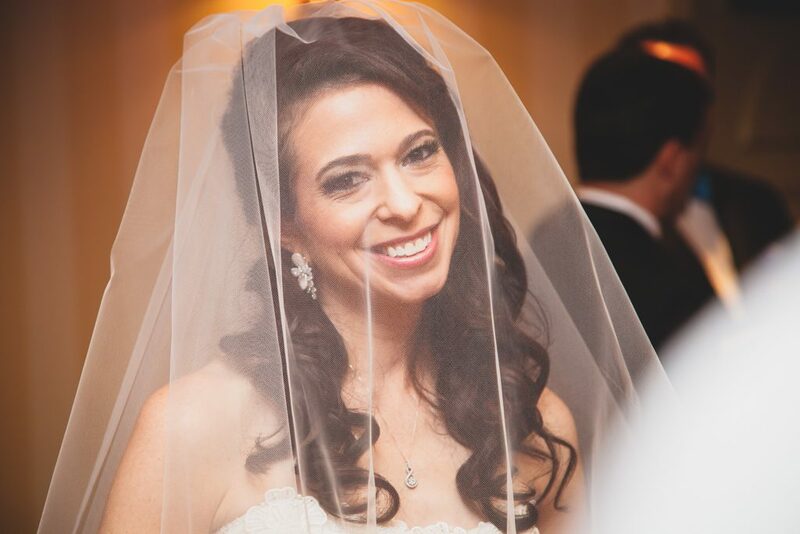 At Lake Shore Photography and Video, our experienced Chicago Jewish Wedding Photographer has years of experience capturing all of the vital moments that make your wedding day special. 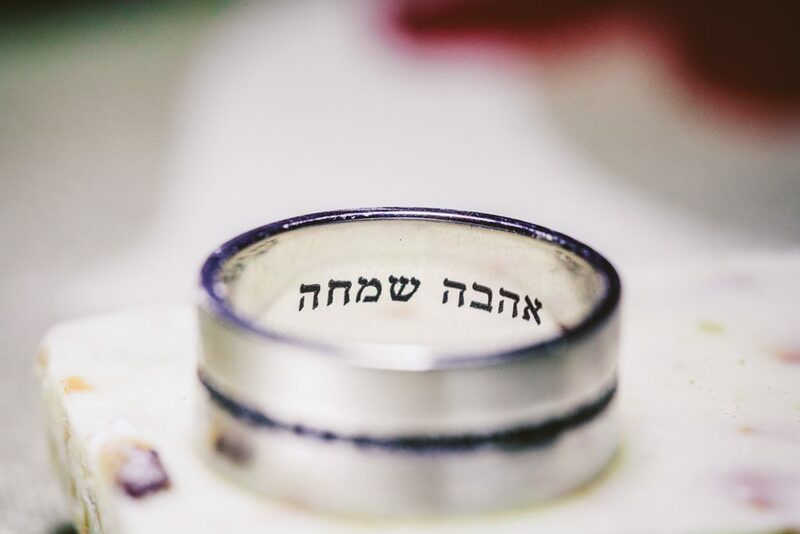 Whether you are signing the Ketubah or standing beneath the Chuppah, our Jewish wedding photographer makes sure to be there to capture each and every spiritual and emotional moment. 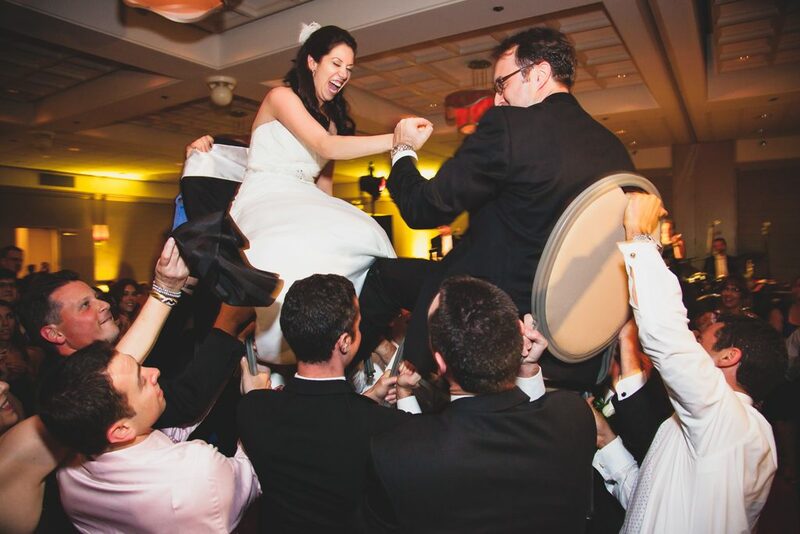 WHY SHOULD I HIRE A PROFESSIONAL CHICAGO JEWISH WEDDING PHOTOGRAPHER? Lake Shore Photography and Video is widely known as a leading Jewish wedding photographer across the country and even around the globe. With our main photographer being of Jewish heritage, we understand the ins and outs of the tradition Jewish wedding, making sure to not miss even a second of your big day. Lake Shore Photography and Video’s contemporary photographic style is ideal for documenting all of the emotions and religious traditions of your momentous day, and is what has made our company so successful as a Jewish wedding photography company. With over 15 years of experience working in the industry, our Chicago Jewish Wedding Photographer has become extremely knowledgeable about Jewish weddings and Jewish wedding photography. We actively continue to find innovative and artistic ways to shoot all of the key moments every time we get the honor to photograph a Jewish wedding and be part of something truly magical. Our Jewish Wedding Photographer makes sure that the importance of this once-in-a-lifetime occasion shared with friends, family and loved ones is captured through gorgeous narrative photography and is presented to you in exceptionally designed wedding photo albums after the day is done, so you can treasure these moments for a lifetime. 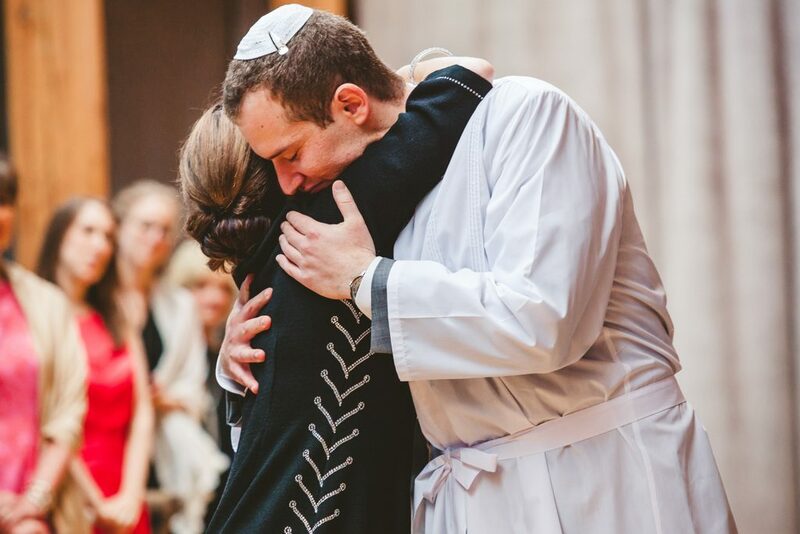 Jewish weddings have a number of exclusive and particular traditions that make them the important religious turning point in one’s life that they truly are. That being said, each Jewish couple and wedding varies significantly; everyone is different, and so are the traditions they celebrate! No matter how religious you may be, our Jewish wedding photographer has experience shooting wedding photos for couples ranging all the way from modern to orthodox. Nonetheless, some Jewish couples only choose to include a couple of the Jewish traditions, while others incorporate none and others observe a considerable amount. Either way, it is important that your Jewish wedding photographer knows about every possible religious aspect of your big day so they make sure not to miss even one second. At Lake Shore Photography and Video, that is just what we bring to the table. Our Chicago Jewish wedding photographer is proud of his Jewish heritage and more than elated to help you rejoice in this meaningful celebration. 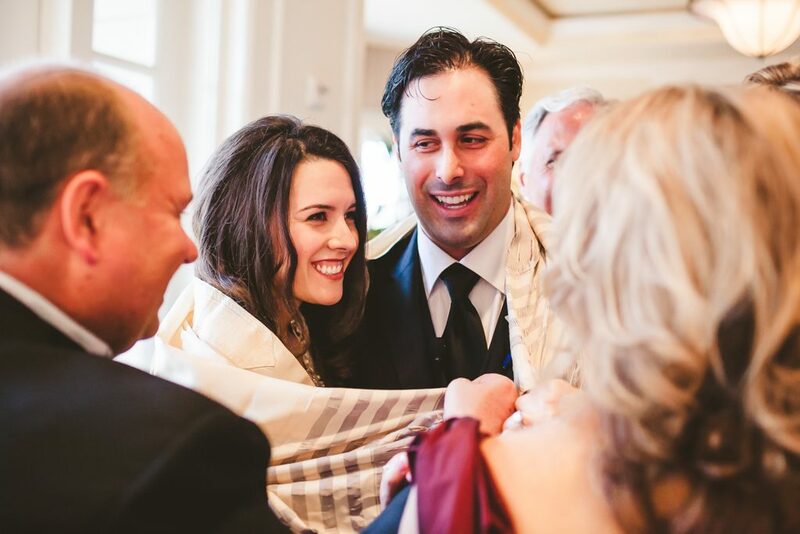 WHICH TRADITIONS DOES OUR JEWISH WEDDING PHOTOGRAPHER CAPTURE? Other than being packed full of love and emotion, Jewish weddings are notorious for the plethora of possible traditions for a Jewish couple to observe on their holy day. 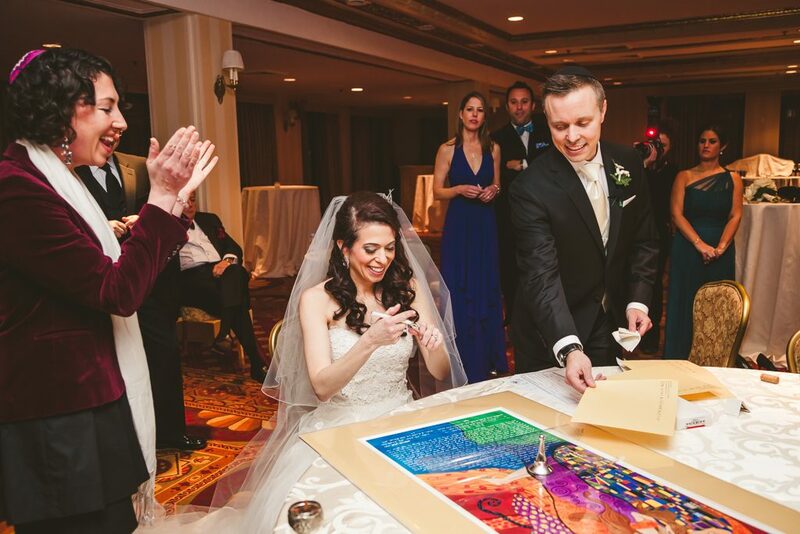 One of the most well-known traditions celebrated during a Jewish wedding is the Ketubah Signing. Occuring before the ceremony begins, the Ketubah Signing represents a very intimate moment between bride and groom and closest loved ones. The Ketubah itself is a Jewish marriage contract or prenuptial agreement that binds the bride and groom together under Jewish law. Outlining the groom’s financial obligations and responsibilities to his bride, the signing of the Ketubah is a very sacred moment and to be present during this act is a great honor. 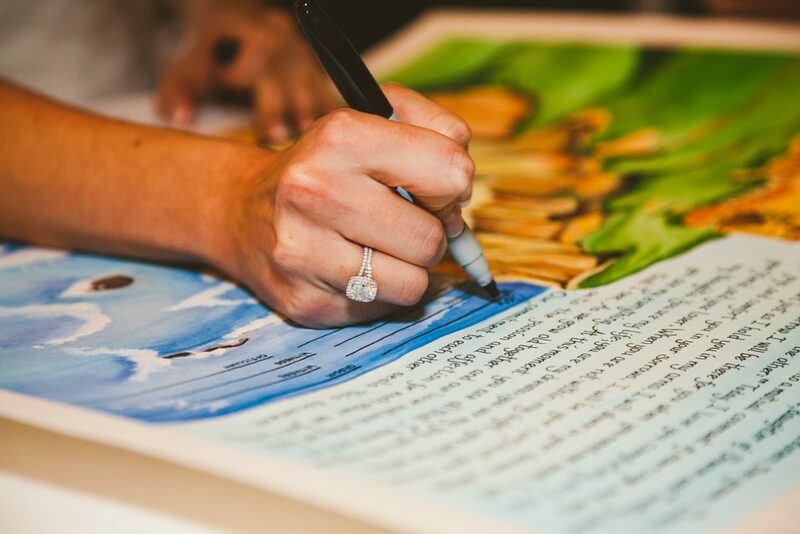 No two Ketubah are exactly alike, making them even more special. 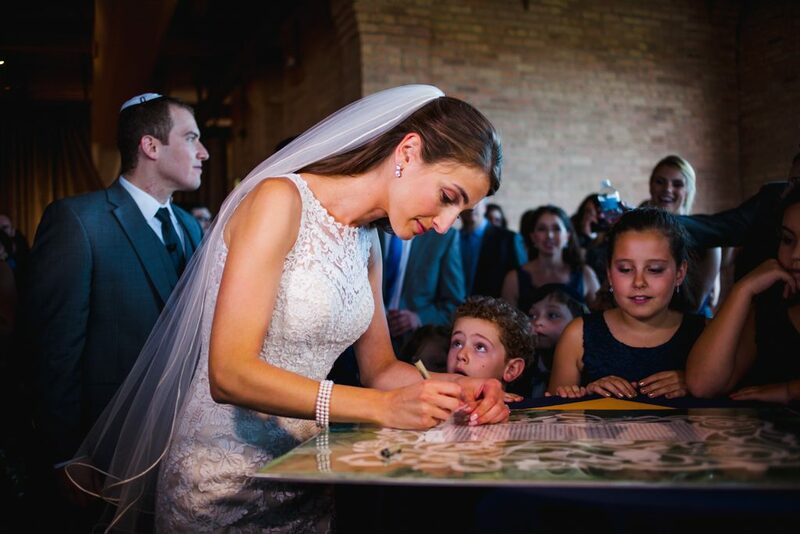 Our Chicago Jewish Wedding Photographer unobtrusively captures these intimate special moments so you don’t have to feel overwhelmed wondering if you will remember each second. Another integral part of a Jewish wedding is the Chuppah. 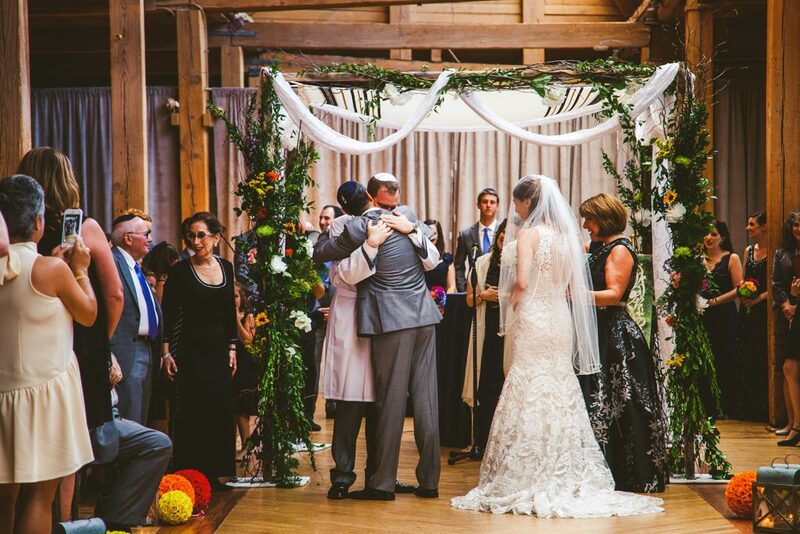 In the Jewish tradition, it is customary for the groom’s parents to accompany him down the aisle to the Chuppah, a canopy beneath which the couple exchanges their vows. The bride and her parents follow behind soon after. Made out of four poles and a covered roof, known as the tallit, the Chuppah symbolizes the Jewish home that the happy couple will soon begin to build and share together. Open on all four sides, however, the Chuppah also serves as a token of hospitality to the guests. The word Chuppah itself actually stands for covering and protection, as it is intended to protect the bond between the bride and groom during their wedding. At some weddings, friends and family hold up the four poles of the Chuppah, whereas in other ceremonies, the Chuppah is standing freely on its own by a structure, often decorated to match the decorum of the entire scene. Whichever you may choose, our Jewish wedding photographer makes sure to capture every tear running down your groom’s face as he watches you walk down the aisle, every gorgeous detail of the Chuppah’s cloth covering, and the look on your guests’ faces while you look your partner in the eye and devote your love to one another for eternity. Sheva B’rachot, known in the Jewish custom as the seven blessings, are often read during Kiddushin, the ring exchange. This exchange is similar to ring exchanges in most other wedding ceremonies, however, in Jewish weddings, it is customary for the groom to place the ring on the index finger of his bride’s right hand and recite the seven blessings. Often read in both English and Hebrew, the Sheva B’rachot focus on happiness and rejoicing in love’s strength. Wine is shared between the couple as presented by the rabbi or a friend or family member to symbolize the celebration of the couple committing to spend the rest of their lives together. 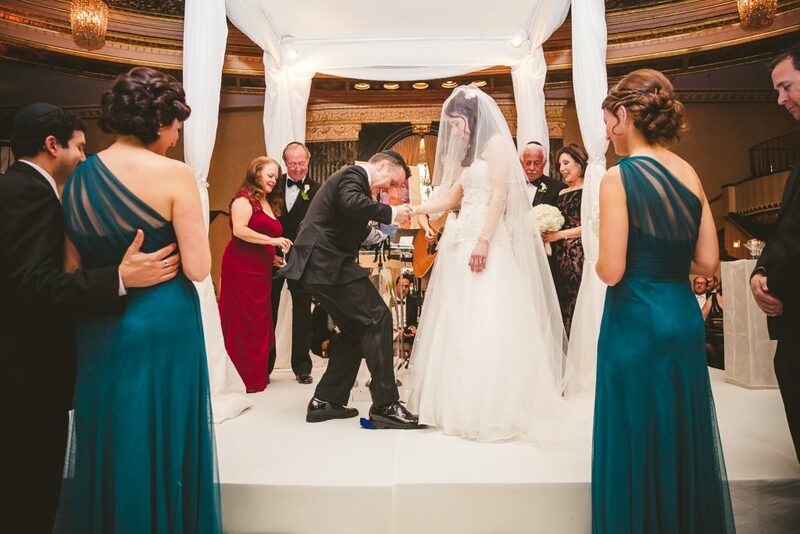 Using various angles, our Jewish wedding photographer captures each necessary aspect of the seven blessings, from the placing of the rings on the bride’s and groom’s hands to the sharing of the wine. These are just a few of the more widely celebrated traditions at a Jewish ceremony that we have years of experience capturing. There are plenty of other essential details custom to a Jewish wedding, like the breaking of the glass, handmade Yamakas, a wine challis (also known as the kiddish cup) for the kiddushin, and the gorgeous embroidered family tallit that the bride and grooms’ parents wrap around them during the ceremony that has likely been passed down for generations. Needless to say, our Jewish wedding photographer is extremely knowledgeable in all things Jewish weddings, even if you’re not! We can help teach you all of this and more, and we love learning more about our religion every chance we get. 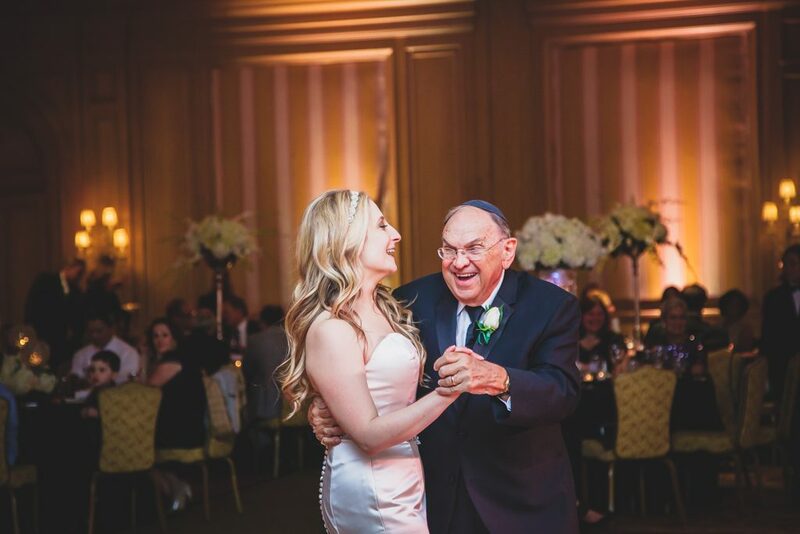 As a highly reviewed Chicago Jewish wedding photography company, we have had some truly wonderful opportunities to capture beautiful moments of love and happiness. 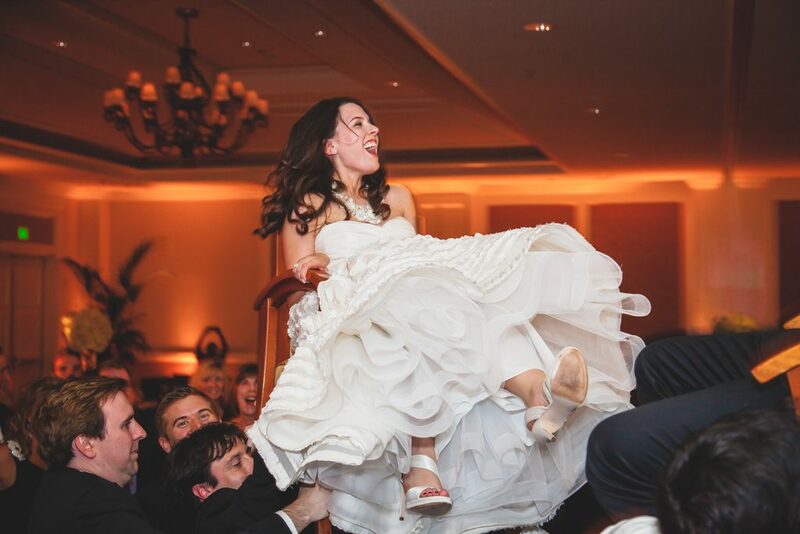 Some of our most adored professional moments and best photos have come from the Jewish weddings we’ve documented. 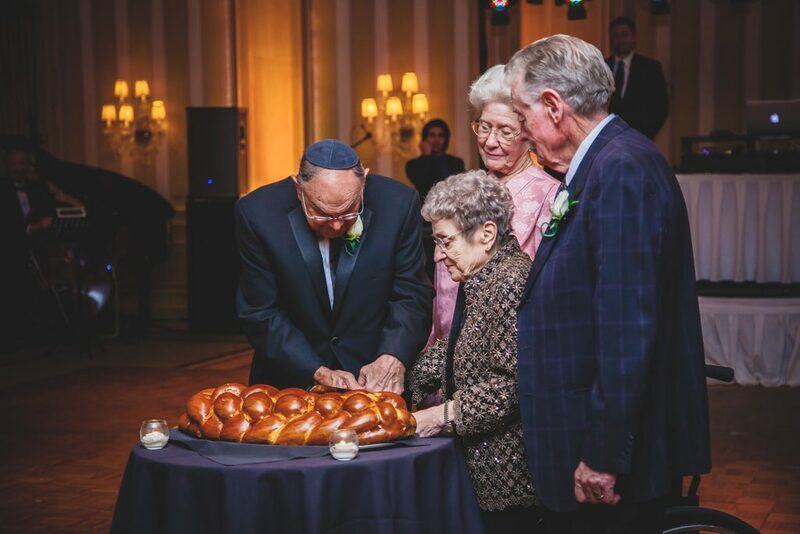 There are a number of unbelievable breathtaking moments to capture as a Jewish wedding photographer, and we are so honored to be able to capture these ceremonies in all over Chicago and elsewhere. It is our privilege to be apart of such a special unique day and we are blessed to be able to express the unique traditions every Jewish couple brings to their big day. 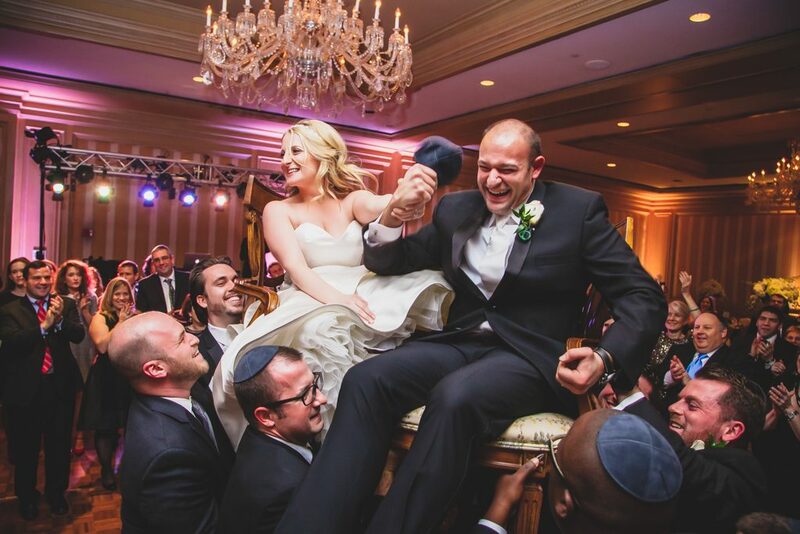 With a professional Chicago Jewish wedding photographer capturing all of the small intimate and emotional moments of your wedding day, you can feel comfortable and secure knowing we won’t miss a beat. 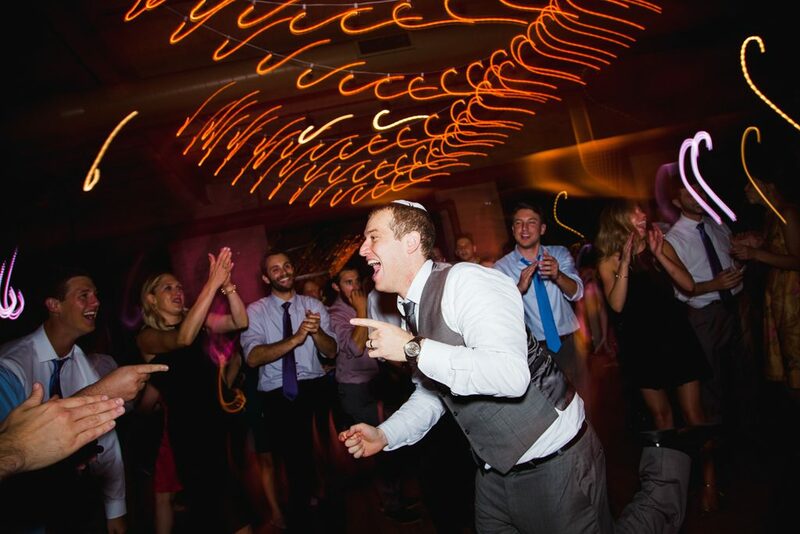 As the number one Jewish wedding photographer in Chicago, we make sure to make your day as memorable as possible by documenting each and every aspect. If you’re looking for a Chicago Jewish wedding photographer to capture the authentic emotions, the timeless traditions and each heartfelt moment of your wedding, then call Lake Shore Photography and Video today at 847-687-2336 for a free quote or contact us here to speak with our devoted Jewish wedding photographer, and we’ll be glad to help!